Like many of us, [Bertho] has had plenty if interaction with “Executive” types who seem to make decisions randomly, and most certainly not based upon any sort of reason. As he was picking through parts bins at his local hackerspace, he thought it would be fun to build an “Executive Decision Maker”. The device he had in mind would answer questions at the push of a button, with the kind of randomness that could only be carefully honed through years of barking orders from a corner office. Constructed from third-rate LEDs and old CMOS chips that were lying around, the operation of the device is quite simple. Much like a Magic 8 Ball, a question is posed, and as [Bertho] states, “The Executive Decision maker automatically tunes into the aether and the subconscious of the user” pressing the “Decide” button. 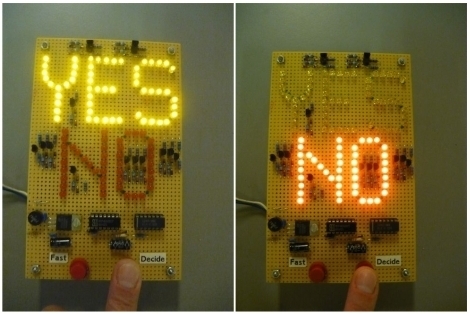 The device then makes a judgement, relaying its answer to the user via an LED display. We definitely got a good laugh out of this one, so be sure to check out the video after the break to see the Executive Decision Maker in action. Awesome! It’s almost exactly like the one Radio Shack used to sell back when I was a kid! The video gave me a good laugh and was well done. Pretty cool little project! Finally I was able to put my mathematical skills to use. Thank you engineering calculus 3, diff eq, and linear algebra! Pretty good probability, and pretty close to real executive decisions I’de say. Bravo, good build, good hack! Thank you for the analysis. I thought about using the FIPS bitstream random test, but then I would have had to push that damn button 20000 times. I especially like the looks. It is kept simple, no arduinos, no overkill, just a bunch of leds and some logic. The video is great, nice humour. If it’s exactly like my boss does, why does it have a “YES” display? That is why yes is in yellow, not green. or… you could just flip a coin. i’m sure that’s what my boss does. Personally, I’d be happy with any decision at all. Just disconnect the power and the emulation is again perfect. Why the “fast” button? Is it really needed? Couldn’t the device accept rapid presses on “decide”? Or is there something I didn’t understand? Executive think: two buttons must be better than one. Perhaps the device is merely very sensitive and must be starved between decisions in order to obtain good results. The fact that you HAVE to ask your boss for a decision would already indicate you do not understand the decision process yourself. So any comments about the ‘randomness’ of a bosses decision would be irrelevant. Plus the device is missing the all-important “Let me get back to you” tri-state. I guess that’s why they get the big bucks. Tom Dowad has updated the project titled myLight LED nightlight. Tom Dowad has added details to myLight LED nightlight. Xasin wrote a comment on project log Finishing up DIYTIL305 1/2. Xasin liked Universal LiPo/Li-ion UVLO with 30V/8A output. Xasin liked OPEN Power (Prototype 1). Mark Zocher liked Desktop printer remake to textile & wood. Belati Dari Timur liked Mildred the Hexapod. Marcos Chaparro has added a new log for Axiom: 100+kW Motor Controller. Squonk42 has updated the log for FunKey project - All your games on your keychain !.